Scientists are looking at how to sequester carbon produced by burning methane in an ice-like state. Scientists at the Oak Ridge National Laboratory are researching ways to use methane as a clean energy source by capturing the CO2 byproduct in an ice-like state. The researchers are using SNAP to look at the molecular level relationship between methane and water to better understand how hydrocarbons are taken up and released in the environment. Imagine a robot sent out on the prowl on this energy hungry planet looking for methane, the principal component of what we call “natural gas” and probably the most abundant organic compound on earth. Our robot would find this energy source in shale deposits, notably here on the east coast of the United States. However, the most abundant deposits of natural gas are under water on the continental shelves and in the permafrost in the Arctic region. 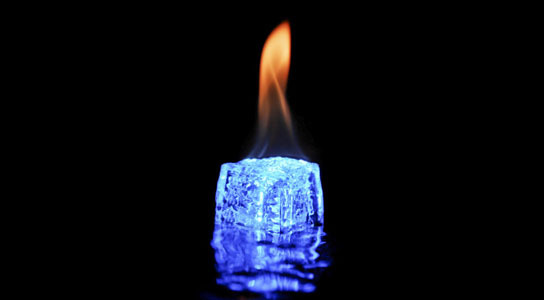 At both poles, methane mixes with water and freezes, remaining trapped as an ice-like compound, for millions of years. Much further afield, methane, along with water and ammonia, are major constituents of Saturn’s icy moon Titan. Some scientists speculate that on Titan there is a methanological cycle similar to the hydrological cycle here on earth. Surface methane evaporates into the atmosphere, where it condenses, and rains down to the surface again. NASA’s Cassini-Huygens Titan probe has been there and sampled it. Methane holds promise as an abundant energy source for tomorrow, but it is Janus-faced: While often referred to as the cleanest fossil fuel producing far less greenhouse gas than either coal or oil, historically it has been seen as a major source of environmental pollution. That’s because burning it produces carbon dioxide, a very potent greenhouse gas. Scientists are looking at how to sequester that CO2 byproduct, in an ice-like state. Such a strategy would create a carbon ‘energy cycle’ in which the methane resource is recovered, used, and then the greenhouse gas sequestered in a form very closely related to the naturally occurring initial materials. To develop such models, they need to understand at the molecular level the relationship between methane and water. Researchers have discovered that water forms cages, called clathrates, that contain “guest” molecules of methane and of many of the Noble gases. At SNAP, a combination of a state-of-the-art instrument, clever experimental technique, and excellent samples have for the first time yielded detailed data on the structure of these methane hydrate clathrates. Under pressure of more than 600,000 pounds per square inch, they found that the correct occupancy for the largest cages in this beautiful structure is three methane molecules. This finding can now be used to benchmark methane and water interactions at various energy and pressure, and researchers can better characterize the hydrophobic interaction. “We’ve done a lot of work on these clathrate compounds,” said Tulk, “but this is the first work in which all the work could be done on SNAP. “When we compress the methane clathrate hydrate, it goes through a phase change at the molecular level to a new high pressure form known as structure H, for the hexagonal (six-sided) arrangement of water,” Tulk explained. Understanding how many methanes are able to fit in each cage and how the methane molecules are arranged within these cages, provides insight into these interactions. The research also assists computational simulation. There are currently no good models to predict clathrate structure. “Determining how many methane molecules are in a cage will give the computational chemistry folks something to shoot for with their hydrate models,” Tulk said. Given these experimental results to come up with a new “potential” — i.e., a new calculation of the interaction force that exists between methane molecules, and between methane and water – computational chemists can calculate the way methane interacts with water in the larger environment. The ball is now in the hands of the theorists, who must come up with a model that correctly predicts this experimental observation. Then they can extend the model to better predict how water and hydrocarbons interact in the larger environment. Be the first to comment on "Methane Hydrate Cages, The Key to Using Methane as a Clean Energy Source?"